We pulled into Zion National Park just after 5pm on day 19 of our trip. We'd hoped to camp at Watchman Campground, but arriving so late, it was full. We found a room in Springdale, the little town that sits, literally, right outside the gate. Springdale is hands down the best town we've found outside a park thus far. It's small, clean, quiet, cute, and has everything you could possibly need. (Laundromat - yes! And it's so clean!) But the people made it really special. Everyone was ready to help answer questions or point us in the direction of someone that could. Arriving after visitor center hours, we had a lot of em. We stayed at Flanigan's Inn, a beautiful spa retreat (that was running an amazing special), complete with a labyrinth to unwind from our day of driving. We were able to connect with Jonathan, one of Sue's friends from high school who now worked on trails at Zion for the park service. 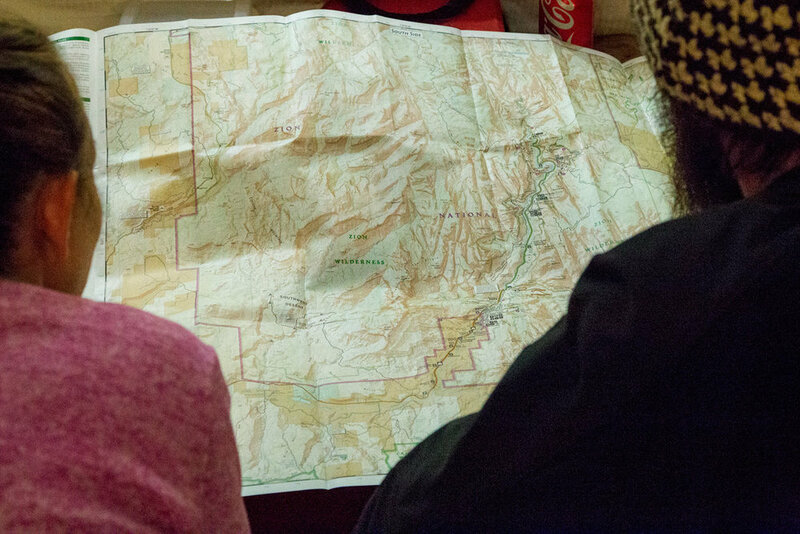 We spent an hour going over maps, trails and hidden gems we should explore. We knew we only had a day to pick and choose which adventure we'd take, but we made notes on the map for when we return. It was great to catch up with an old friend, and getting the inside scoop about the park was beyond helpful. During peak season (March 15 - October 25), parking at the Visitor Center and hopping a free shuttle to various trailheads is mandatory. 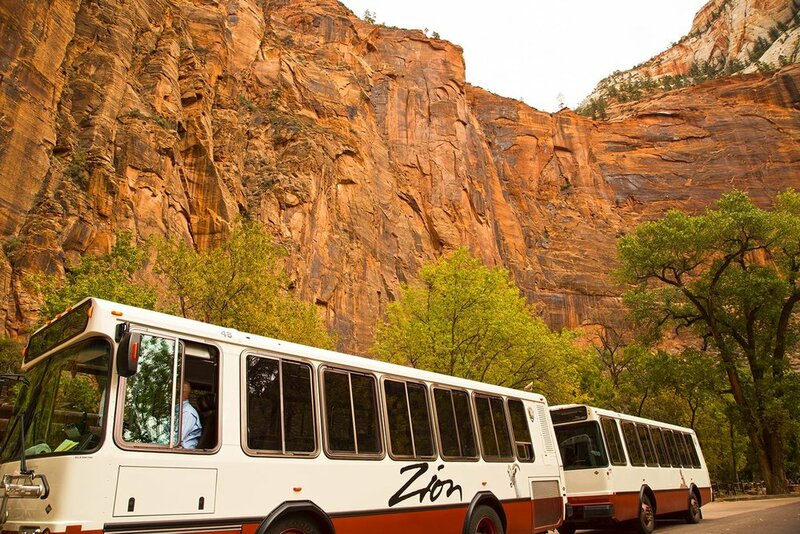 After October 25th, shuttle services stop, and you're able to drive the 6-mile road up Zion Canyon. The previous weekend saw thousands of visitors, so they extended mandatory shuttle services while we were there. Lily was ecstatic, she really wanted to ride in the back shuttle car, being pulled through the canyon. The next morning we got up, got packed, and took the short drive to the park entrance. We grabbed the day pack, threw in lunch and waterproof socks, and went to check out the Visitor Center before catching a shuttle. 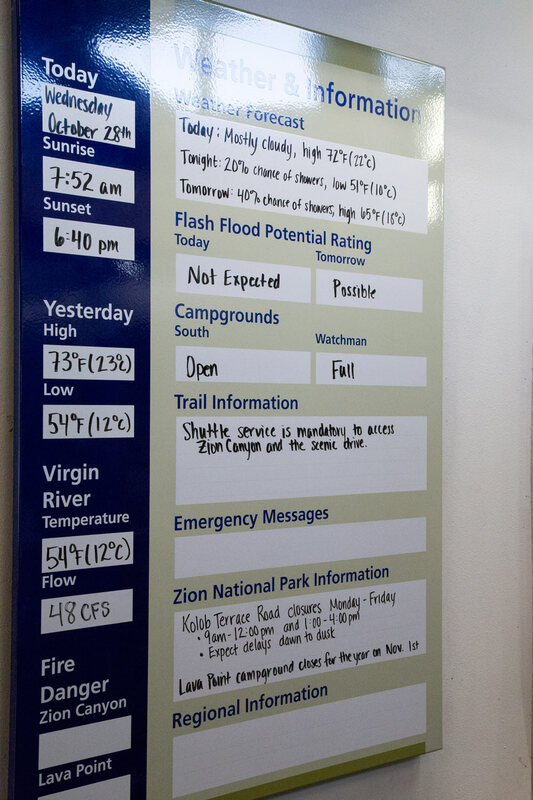 I found a weather forecast and river conditions. High of 72, water temperature a chilly 52 degrees, no flash flood potential. As we were rounding everyone up to head out, I saw the kids looking at a giant map of our country's Wilderness Preservation System. I was so excited, I went over and pointed out to them that way over on the other side of the map, that very small green section is Thompson Island, which is in our backyard at home in Pennsylvania along the Allegheny River. A moment for all of us. We're gaining a better understanding of why protecting these special places is so important. The shuttle ride was everything Lily hoped it'd be, complete with canyon history and interesting facts, elk sightings, and a couple friendly hikers playfully questioning how they'd been out of school so long. 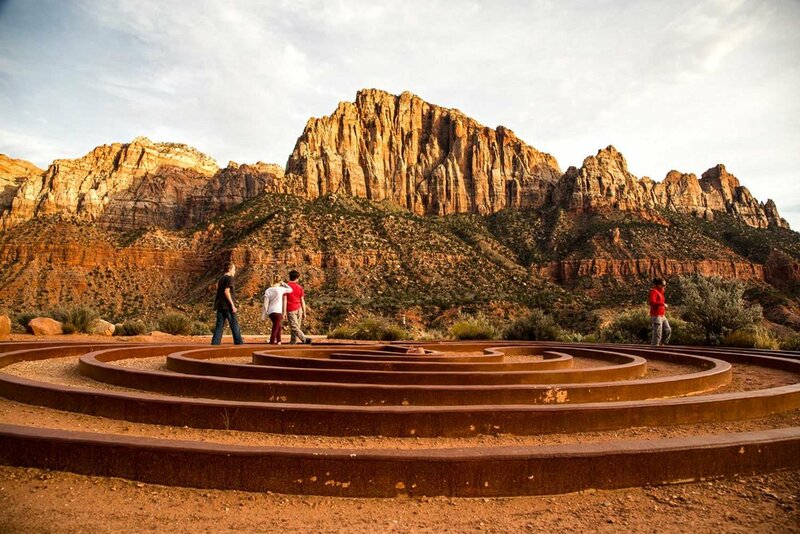 We got off the bus at the furthest end of Zion Canyon in a natural amphitheater called Temple of Sinawava, about a 30 minute ride from the Visitor Center. We picked up the Riverside Walk from there and headed toward The Narrows. 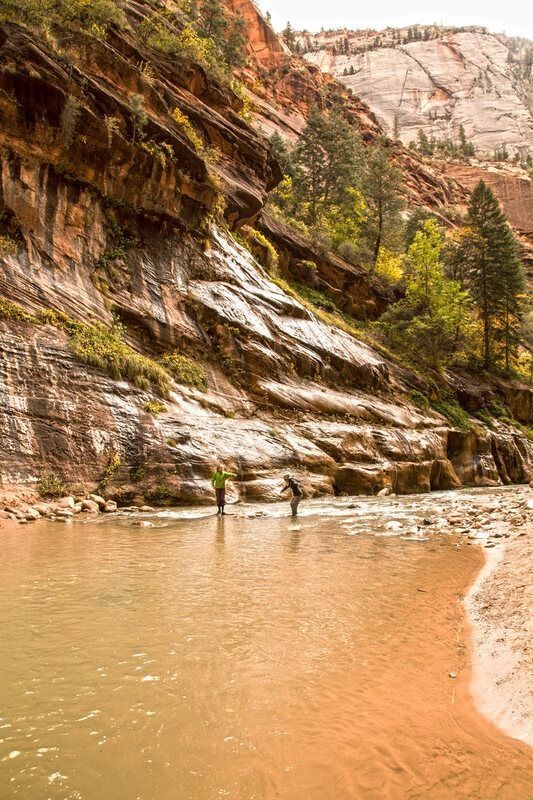 After a mile walk, the trail ended and sandstone walls began to close in, leaving nothing but the Virgin River between em. 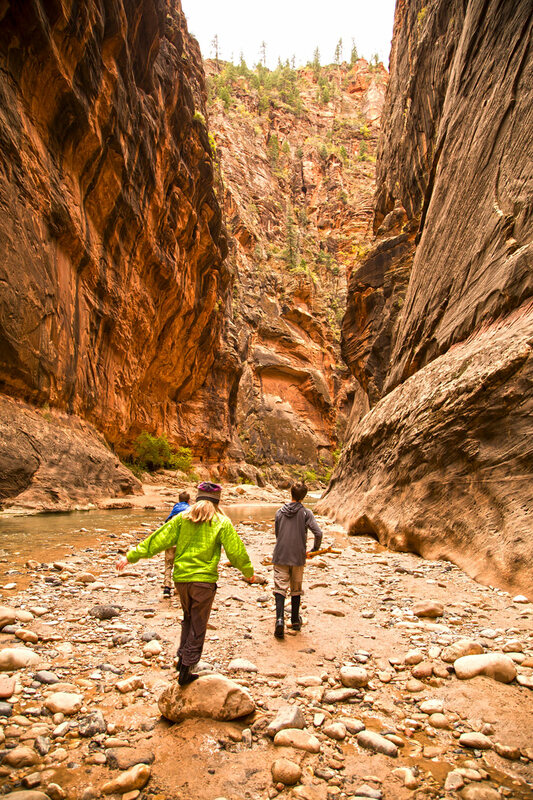 We put on waterproof socks as quick as we could, and were ready to explore. Just before we left, a really sweet older gentleman that was extremely excited for us (especially the kids) to hike in, showed us to the stick wall. It's along the lines of penny jars you might find in a store. "Have a stick, leave a stick. Need a stick, take a stick." Awesome! Sticks in hand, we were off! As soon as we got around the first bend, we had the place to ourselves with the exception of a couple people passing by. 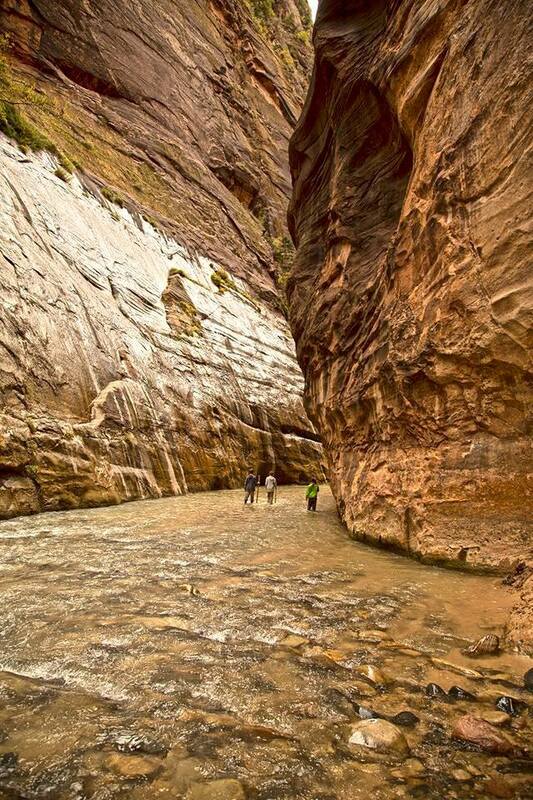 The Virgin River is the trail, making for a fun challenge trying to find the path of least water. Phoenix mentioned he was glad he'd brushed up on his rock-hopping skills at Yosemite the week prior. We explored for hours, in awe around every bend at what was ahead of us. It's hard to wrap your mind around the fact that this was created from the continuous flow of water over millions of years. Just amazing. Our waterproof socks worked like a charm for the first few miles, but we eventually started to get a bit more playful which led to sloppy footing, letting a little more water in each time. We traversed one spot that had water just below our knees, using the canyon wall as our guide. Pure fun! After a full day of hiking The Narrows, we finally made it back to the Riverside Walk. It was just as we'd left it, with a small crowd of people welcoming us and asking questions about what the trek was like, genuinely excited to hear the kids take on the experience. We talked shop with folks from all over, switched our socks, and started the walk out. 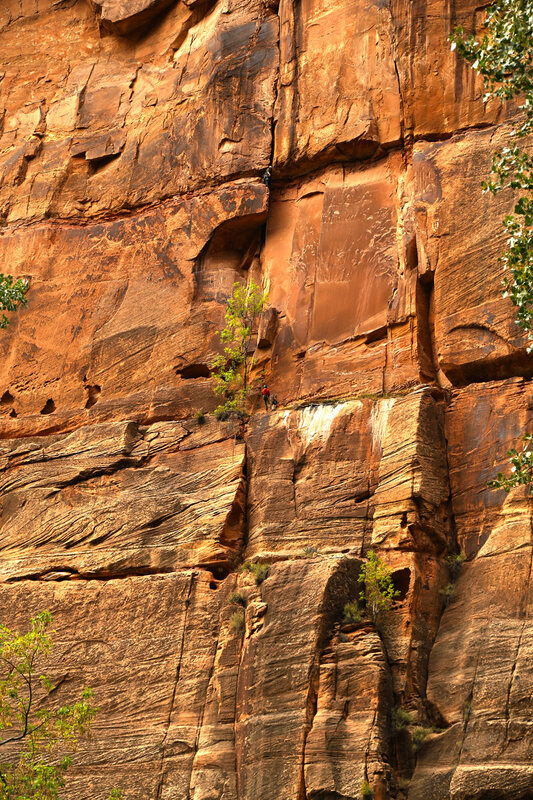 We came around a bend in the trail to see a small crowd of people looking up at the canyon wall. Climbers! It took us a minute to find em, but the bright red jacket made it a little easier. Woah... not for the faint of heart to be climbing these walls. Phoenix had a staring contest with a squirrel that'd been following us most of the walk. Every time he'd stop, the squirrel would stop and look right at him. This continued until we rounded a bend and saw a scary looking critter we later found out was called the Jerusalem Cricket. Straight from your nightmares, it appears to be equal parts red ant, bumble bee, spider and grasshopper, roughly 3" in length. I nearly stepped on it (yikes!) 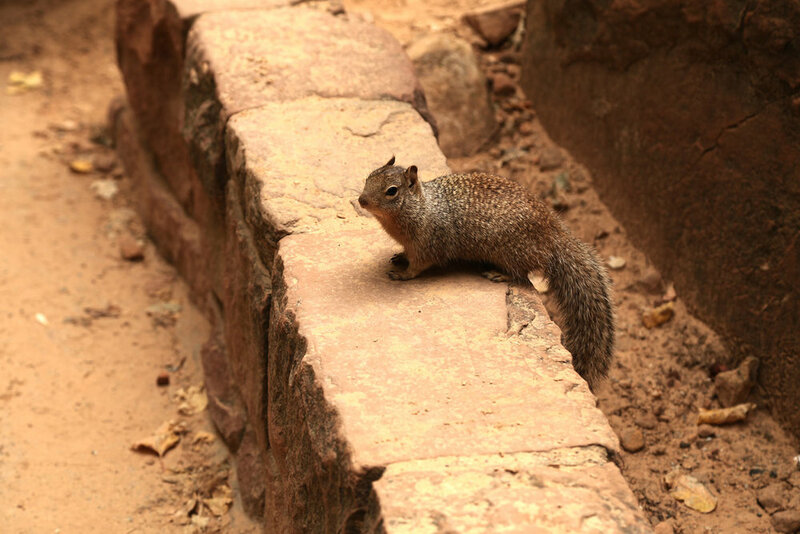 and we spent the next few minutes examining its every move until it made its way off the trail. Back at the car we loaded up gear, changed into dry clothes, and headed out. Jonathan's recommendation to take the Zion - Mount Carmel Highway on our way out was a good one. What a beautiful drive... and it boasts one of the world’s longest tunnels at a little more than a mile long. Pretty wild that construction of the tunnel began in the late 1920's and was completed in 1930. Once again, we left a park absolutely stunned by its natural beauty! Ash found his favorite park, and it was agreed that we could all spend weeks exploring here. We'll definitely be back for you, Zion. But for now, we're buckling up and heading toward Horseshoe Bend!